We celebrated Markito’s 9th birthday on Thursday 26th October, halfway through our sail from the Torres Strait Islands to Darwin. We were just off Cape Wessel, 280 nautical miles west of our last port of call and sailing at 6.27 knots through the Arafura Sea, when we sang happy birthday. Markito blew out the candles and we ate his birthday cupcakes, decorated with blue icing, sprinkles and M&Ms. Earlier that day the festivities had begun when Markito was relieved of his usual boat duties (each morning he washes last night’s dishes, prepares breakfast for all the kids and vacuums the boat) and we had a special egg and bacon breakfast. We had decided to anchor at Cape Wessel on Wednesday night as we’d been traveling non-stop since Monday and the easily accessible anchorage, not far off our planned route, was a good opportunity for Simon and I to get a full night sleep. At 9am we pulled up the anchor and set sail again, while the cupcakes were baking in the oven. The weather was mild that day and much to my relief, the swell we’d experienced for the first three days had flattened out. I found those first days mildly uncomfortable as the swell, combined with the easterly breeze blowing the smell of the engine’s diesel into the cockpit, made me feel a bit seasick. Thankfully the conditions didn’t affect anyone else, and I was able to take my travel sickness tablets to manage it. 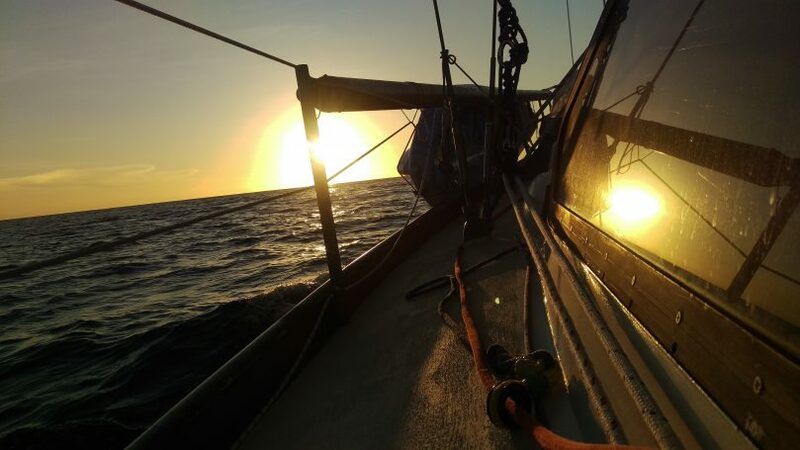 On Thursday I was feeling much better, and by Friday and Saturday that week the swell had completely disappeared and we were cruising along in flat calm ocean. 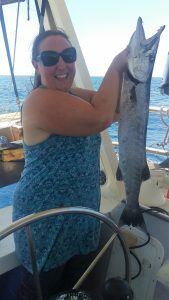 We caught 3 barracuda on this trip. One the day before Markito’s birthday, and two the day after. They were nearly 1 metre long – our biggest yet! We ate some and put the rest in the freezer for later. 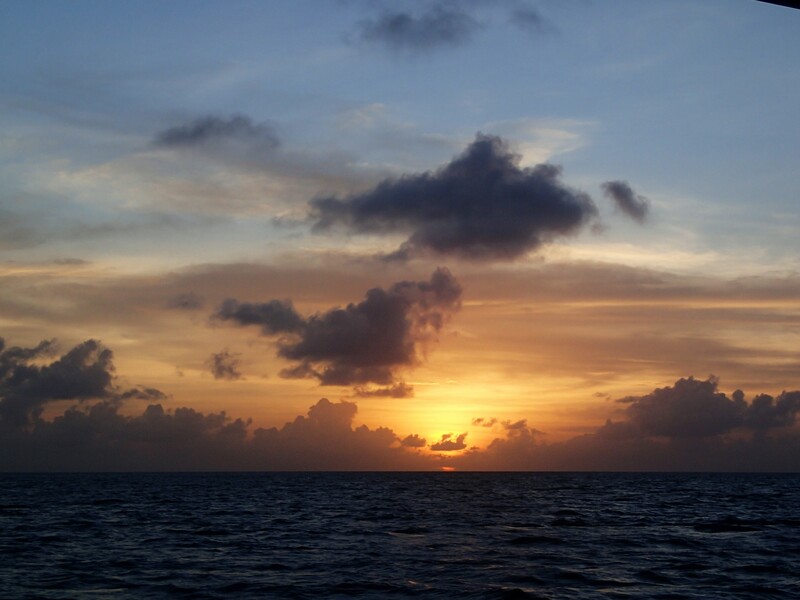 Even though this has been our longest time at sea so far, and the furthest we’ve ever been away from land, we were able to settle into our groove and the time passed surprisingly quickly. Simon and I shared responsibility for the boat, giving each other time to take naps in the day or sleep for a few hours at night before we’d swap again. We had expected to see more container ships passing us along this route, but we only saw 3 over the whole week. Morale on the boat was high, everyone was in a good mood for the majority of the trip and we amazingly didn’t experience any cabin fever. Life goes on, even out at sea. 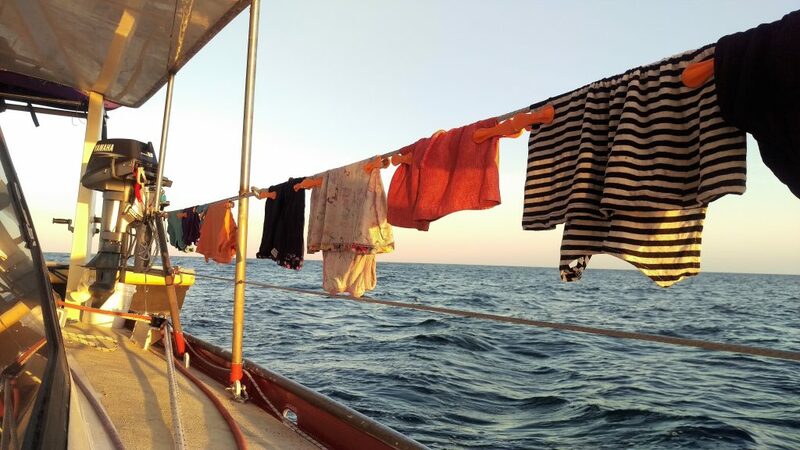 We did a load of washing on Friday so we had clean clothes ready for Darwin. The kids exhausted all the play options available to them. They moved around the boat depending on what they were doing. In their bedrooms its lego (thanks Zelda! ), figurines, puzzles and books. In the main cabin they watch movies on a laptop, share Markito’s tablet around for games, build things with coloured blocks, role play, play cards and draw. In the V-berth up the front, they play-fight, build pillow cubby-houses and watch more videos. At one point I found two yellow hair-ties and gave them to Freyja. She was so excited to have something new! Then I found two green ones for Zach. Well, that kept them busy for an hour or two. As we got closer to Darwin we felt the humidity level gradually rise. We arrived safely in Darwin on Saturday 28th October at around 10pm. It was a little tricky arriving at night but Simon did a great job navigating and guiding us in. We spent exactly one week there. It was tiring as the humidity really drained our energy. There were lots of jobs to get done so we hired a little car for a few days and thoroughly enjoyed the air-conditioning. 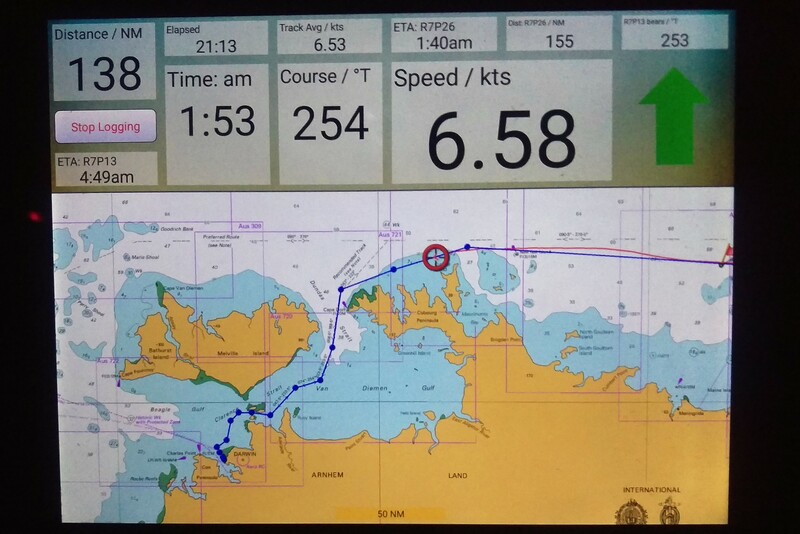 This is our electronic chart program showing our route and progress as we began the last part of our sail past the Tiwi Islands and into Darwin. Simon marked the way points before we began the trip and then adjusted the route as we went. 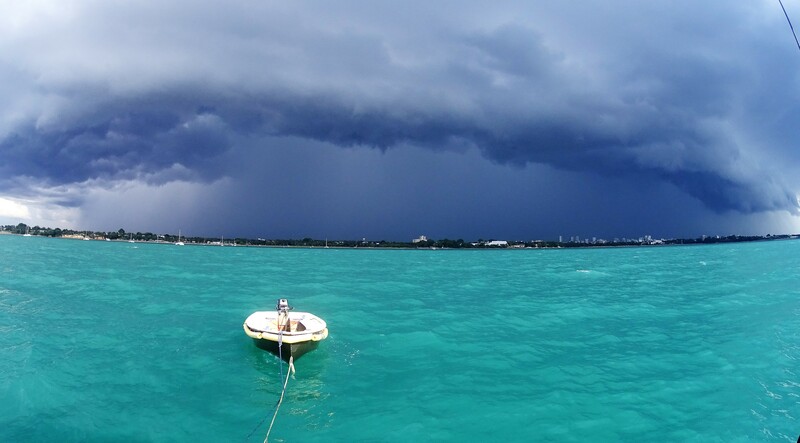 We experienced a big storm while anchored in Fannie Bay, with winds up to 45 knots and a downpour of rain. It was a great way to experience our first serious storm aboard. We felt really confident. We watched it coming so had plenty of time to prepare and it was one of those classic tropical storms that passed through quite quickly. Just ten minutes later the sky was clear and blue. Here comes the storm! 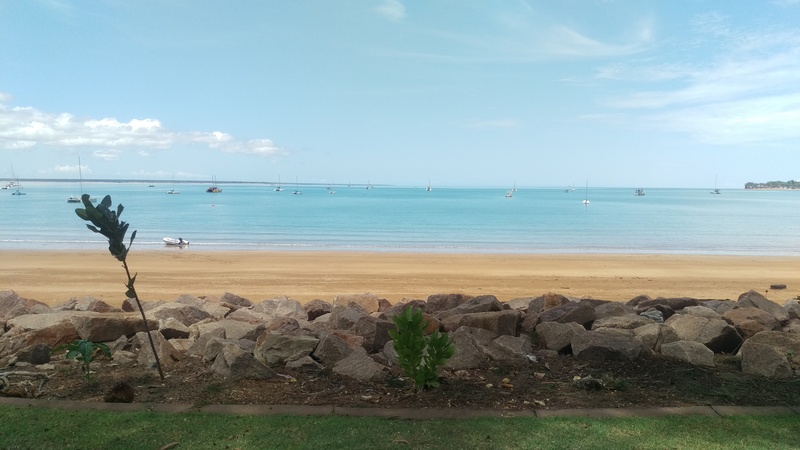 Fannie Bay, Darwin. 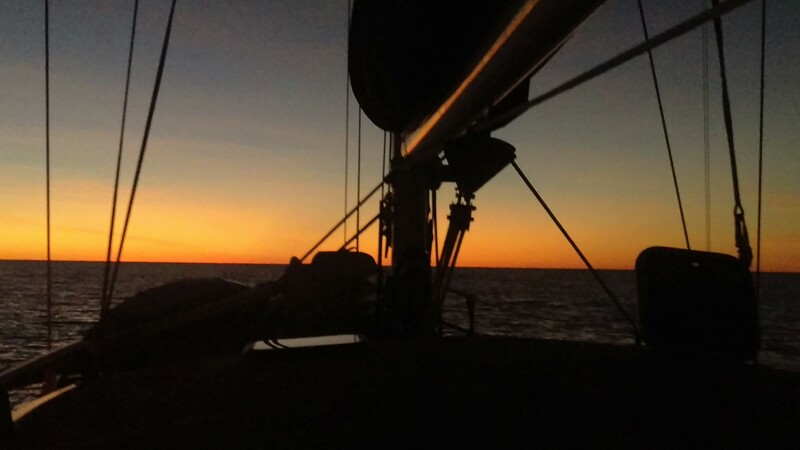 We left Darwin at sunrise on Saturday 4th November. Stay tuned for the next blog post about our passage from Darwin to Dili. Our first experience sailing overseas. So many firsts! Sunset on Day 1. Monday 23 October. Sunset on Day 3. Wednesday 25 October. The anchorage at Fannie Bay – our home for a week. A beautiful part of Darwin.